Easter in the 2013 gardening calendar is going to be exciting one for us in so many ways and if the weather is kind it’s certainly going to be a busy one!. They’re predicting cold in most parts of the UK over the weekend so if you’re planning to head into the garden like me it looks like we’re going to need those extra layers. Here are five jobs we’ll be doing in the garden this Easter weekend. I’ve had a grape vine (Phoenix, Vitis vinifera) for 3 years and it always seems to do well, which I think is down to our thin chalky soil. When it comes to looking after a grape vine I’ve learned over the years to treat em mean and keep em keen. In other words don’t be afraid to prune your grape vine, unless you have a rambling vine in which case just let it do it’s own thing and thin out the growth later in the year. 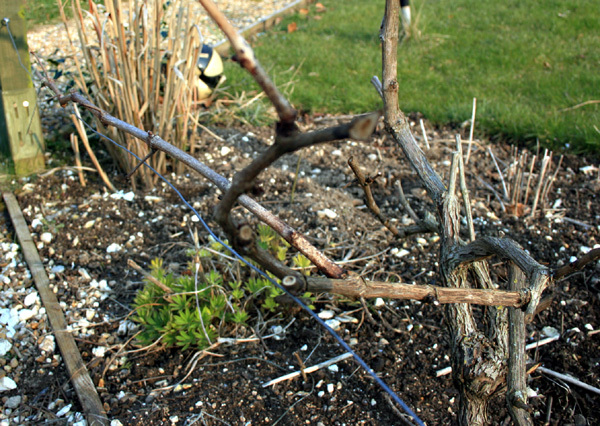 In my experience the harder you prune a grape vine the more it seems to want to respond. I train mine as a cordon (I think it’s called the Guyot system) keeping the vine down to 2 main laterals which I run left and right on wires. I keep these laterals to around 10-12 buds max and keep them tied into wires using soft garden string. 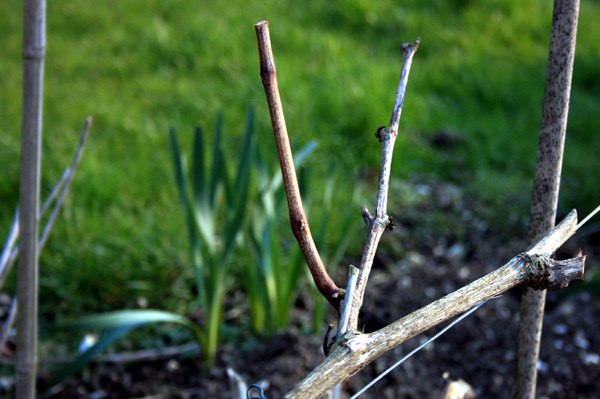 As the buds break and grow away I train them up to the wires until there are around 4 nodes or buds per stem. I then trim the subsequent growth to a minimum of 4 bunches per stem, which ensures all the energy goes into making loads of delicious grapes and not into growing more vine. A couple of weeks ago I transplanted my raspberry canes into a redundant part of the veg patch in the garden. I usually plant fruit canes in January, but given the cold weather the canes are still dormant, so they should survive the move. If you don’t want your raspberry canes falling all over the place you’ll need to provide adequate support. 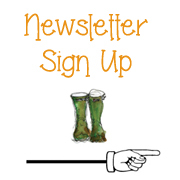 Don’t skimp in this area is my advice if you want an easy life later in the summer. I’ve learnt the hard way and used all sorts of methods from a piece of string tied between bamboo canes, too individually staking each cane (yes I really did stake every single cane). The best solution I find is to take two or three 8 foot 4 x 4 inch square posts and cement them in a hole at least 18″ deep. Not cheap I know, but it will last much longer. Then head to the local hardware shop and buy a few screw in wire connectors and some reasonable heavy gauge wire. 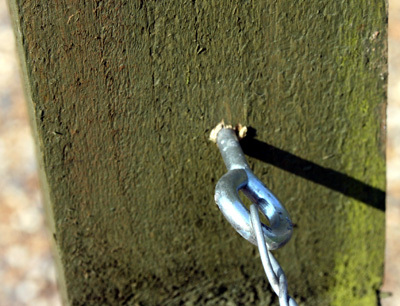 Fix the connectors to the inside of each post approximately 2 feet apart and run a length of the wire through the connectors and twist the ends to make a fixing. The secret is to make sure they are nice and tight. If you’re planning to plant a few canes (or any soft fruit bushes) then my advice is prepare a trench in advice of planting if possible. I usually dig a trench about a spades width across and a spades depth deep. You don’t need a massive trench as raspberries take up moisture through the fibrous roots that sit just below the surface, so avoid planting them too deep. Also the roots need oxygen so bury them too deep and they are less likely to survive. Bit like us really! Into the trench goes a barrow load of compost which I fork into the soil. I then plant the canes until the roots are completely covered. Throw in a sprinkle of fish blood and bone around the roots and heal them in nice and firm. Finally give them a good drink and they’ll do you proud. Job 3. Pot On Last Years Softwood Cuttings. For the last 3 years I’ve been learning how to raise plants from cuttings with varying degrees of success. Last year was my best year yet and I’m pleased to say 99% of the cuttings I managed to root have survived (so far) through a cold winter. Always amazes me just how resilient plants really are. It’s really easy to raise plants from cuttings and anyone that reads my blog on a regular basis will know it’s become a bit of passion of mine. 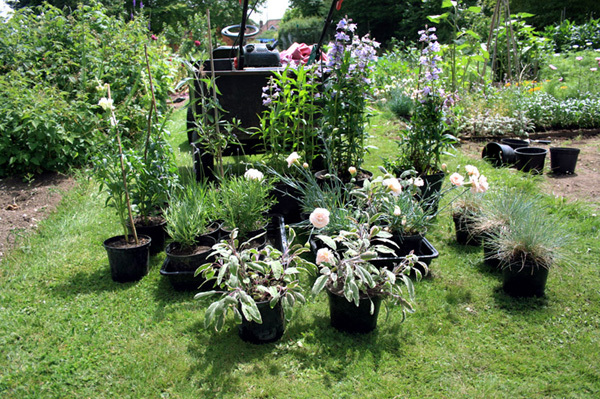 Last year I even managed to sell a few plants which brought in a little extra cash into the household budget. 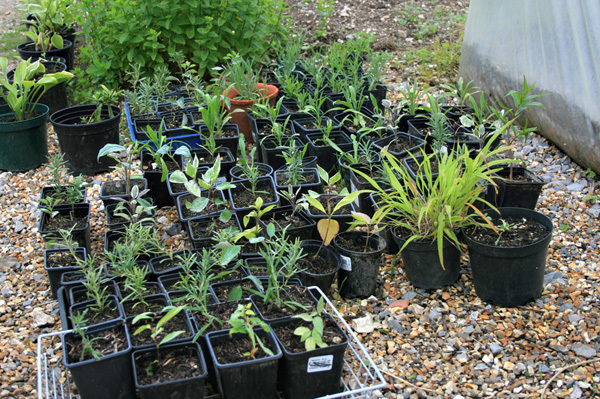 These are just a few of the plants I raised in 2012 just before they were going to the customer. This weekend I’ll be potting up last years cuttings into larger pots so they can grow into great little plants, just as soon as the weather warms up that is! Job 4. Spring Clean The Wildlife Pond. … then it’s going to need a Spring clean. 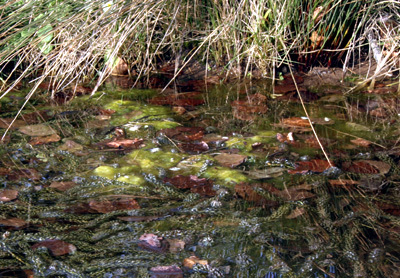 I’ve noticed we already have frog spawn in the pond, so probably best to collect it all up in a bucket first and return it when you’re finished. Basically all I do in the Spring is thin out the oxygenating plants (elodium) and remove as many of the fallen leaves and decaying plants as I can. 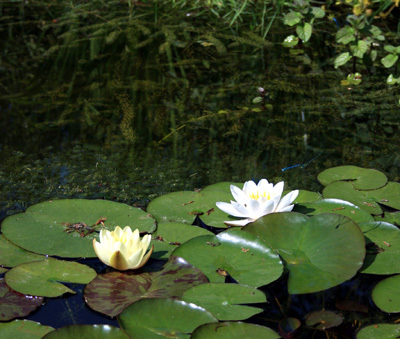 It’s important to remove leaves from a pond or they will eventually decompose and give off noxious gasses which will discourage the wildlife from coming to the pond. Job 5. Tidy Up The Herbaceous Borders. One of the most satisfying jobs in the garden at this time of the year in my view is clearing and preparing the herbaceous borders ready for the summer ahead. Nothing too strenuous of course, just a little light pruning on the roses and removing the dead or decaying growth from last years gems. 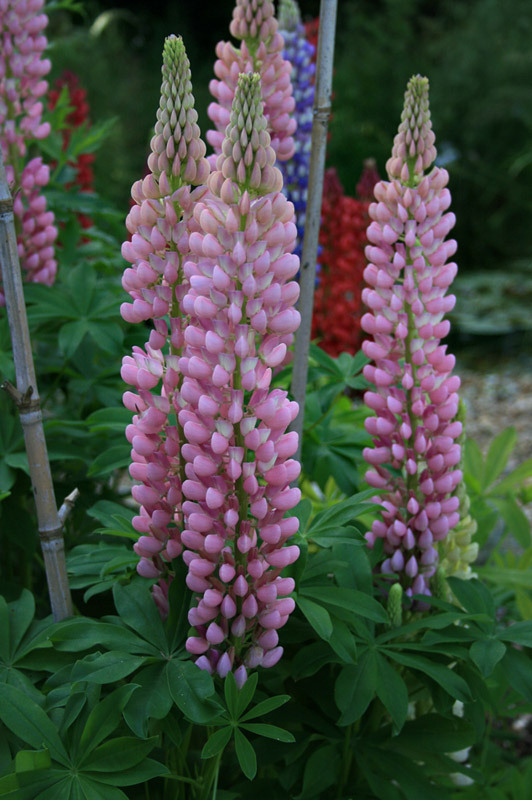 The Lupins have already started which is a sign of great things to come. One task I have to perform every year (and for most of the season come to that) is to remove as many of the large stones and flints that rise to surface each year. The borders seem to suffer the most as we are on chalk, on top of which is a layer of large flints and stone in this part of Hampshire. Great for trout rivers they tell me, but pain in the bum in the garden. After I’ve cleared the beds of all debris I mulch with a good layer of well rotted garden compost. Always amazes me where it all goes, but sure enough by the end of the season it will all be consumed by the worms and other insect life and put back in to the soil. Nature is a truly wonderful thing. Well that’s my weekend in the garden sorted. I wonder what jobs you’re planning in the garden this Easter weekend?